I've got a special place in my heart for Stryper. In the mid-90s, when I first got into metal, it wasn't easy to find music on the Internet and my friends didn't listen to it, so used music stores were the place to look. If there was one kind of music getting dumped as fast as possible in the mid-90s, it was heavy metal, and if there was one kind of metal getting dumped, it was Stryper. I grabbed a bunch of their albums and was delighted with their music -- the melodies, sound...and the offense that it caused others when I played something as deeply, terminally uncool as Christian hair metal from the 80s. Now the original lineup's back with Second Coming, an aptly-named album consisting of re-recorded old material with two new songs. Listening to it is an interesting experience. Since these are re-recordings, you can expect no changes from their former trademarks -- harmonized guitars with screaming solos, a high tenor vocal lead with lots of chorused background, beautiful melodies, and unabashedly, occasionally cringe-worthy Christian lyrics. Although I suspect the re-recording was needed for contractual purposes, the band clearly had a lot of fun making this and put some serious effort into making it perfect, rather than just leaving everything up to the production studio. I remember reading an interview back then and being struck by the fact that the vast majority of the individual members' favorite songs were from The Yellow And Black Attack! or Soldiers Under Command, their early albums, when they had less commercial pressure on them, and the mix is reflected in this. All the re-recorded tracks are from either those two albums or their hit album, To Hell With The Devil -- nothing from the later, weaker albums -- and together they comprise a good sampling of highlights (although I did miss Holding On and Lady). The feminine-sounding power ballads (including Honestly, a big hit in the 80s) are thankfully ignored, with the exception of First Love, which I always considered their best. The musicianship has only gotten better with age. Michael Sweet's vocals have deepened a bit, to the point where I wasn't actually sure it was him at first, but he hits the notes effortlessly, singing several parts differently from the original albums, almost as if improvising at a live show. Oz Fox, who always was an underrated guitarist in the 80s, is beautifully showcased (he does most of the solos), while Sweet, who plays both rhythm and lead melodies, provides a fine guitar performance in his own right. Backing Sweet's and Fox's guitars, the complexity of Tim Gaines and Robert Sweet's bass and drums comes through a lot better in this album with the modern production; you can hear every little note-change in the bass and every component of the drum-set, especially in some of the To Hell With The Devil tracks. That being said, the two new tracks are decent, but not amazing. 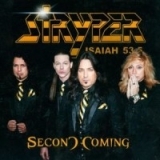 Like their music or not, it has to be admitted that Stryper really hasn't written a great metal song for some time, and anyone hoping for something that would have sounded like more than "reunion album" material will just have to be patient a little longer. The solos are good, but the melodies are more like something that would have ended up on Against The Law, their good-but-not-great departure from their early 80s sound, which is rather disappointing. This is a really good "greatest hits"-style album. Definitely a must for Stryper fans, but for everyone else? Well, if you didn't like them before, you're not going to be any happier with them now, but if you do like melodic 80s metal and don't have a serious problem with Christian lyrics, I'd strongly recommend it. Stryper's put a lot of work into trying to recapture the magic of their original albums the way they wanted it played, and it makes for both an excellent retread of old material for former fans, and a good introduction to their work for new ones.